ABC has a surprise in store. Today, the network announced they will premiere a sneak peek of their upcoming series Downward Dog in May. ABC‘s sneak peek of Downward Dog will air after the season finale of Modern Family on May 17th. All-new comedy “Downward Dog” will premiere in a special sneak peek WEDNESDAY, MAY 17 (9:30-10:00 p.m. EDT), following the season finale of “Modern Family.” (Editors Please Note: “black-ish” will air its season finale Wednesday, May 10). The series, the first network comedy to have its world premiere at the Sundance Film Festival, will move to its regular time period, Tuesday nights at 8:00-8:30 p.m. EDT, beginning May 23, on The ABC Television Network. Based on a web series, “Downward Dog” follows the day-to-day life of Nan (Emmy and Golden Globe-nominated Allison Tolman, “Fargo”), as told by her increasingly lonely and philosophical dog, Martin (voiced by Samm Hodges). Nan attempts to juggle her tumultuous personal life with a stressful career, unjustly supervised by her self-obsessed boss. Having her story told from the canine perspective provides a uniquely unfiltered point of view that helps us laugh and cry about what it means to be a human being in the twenty-first century. It’s a show about a dog and the girl he adores, and even at their worst, Nan and Martin just might be best for one another. 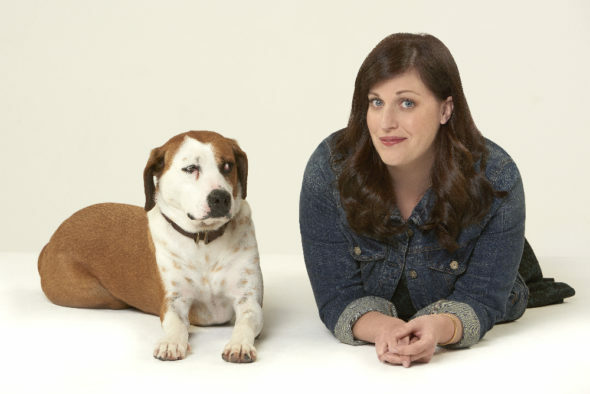 “Downward Dog” stars Allison Tolman as Nan, Lucas Neff (“Raising Hope”) as Jason, Nan’s ex-boyfriend; Kirby Howell-Baptiste (“Love”) as Jenn, Nan’s best friend and co-worker; and Barry Rothbart (“The Wolf of Wall Street”) as Kevin, Nan’s boss. What do you think? Do you enjoy ABC’s comedies? Will you watch Downward Dog? More about: ABC TV shows: canceled or renewed?, Downward Dog, Downward Dog: canceled or renewed? Downward Dog: Would You Watch Season Two? I’m a dog lover so I absolutely adore Martin & Nan. Very clever to show their relationship from the dog’s point of view. absolutely love this show. am a life long dog lover!!! Martin is the best. Yes I loved the pilot.. Can’t wait ! Typically don’t watch sitcoms; but as a dog nut will likely at least check it out. I love talking animals. I’m willing to give it a chance. It will be down in low ratings. Stupid shows keep coming on ABC. Love dogs & l0ve this actress. I’ll certainly tune in.